ANNAPOLIS, Md. 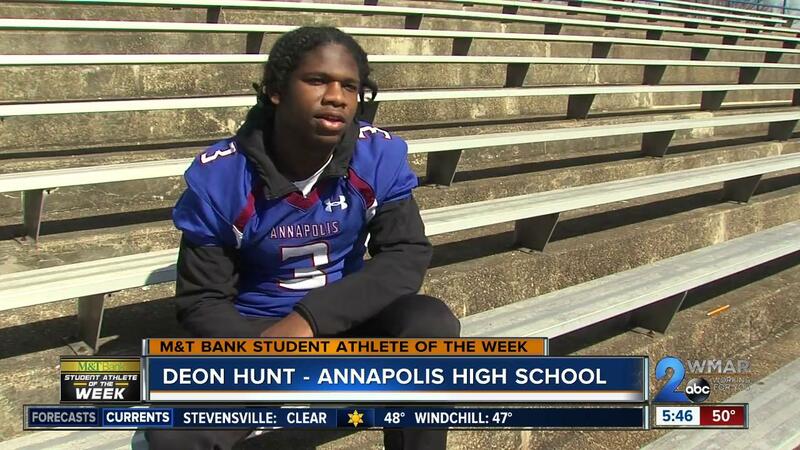 — Deon Hunt pretty much plays it all at Annapolis High School. “I play football, baseball, basketball and I ran track,” said the junior. His main sport is football. You can say he's versatile. The junior captain would probably play more if his coaches wanted. “Whatever is better for the team or whatever the coaches think that I could do then I'm putting all effort into it,” said Hunt. Effort is what he's all about. He's not only lifting up his teammates. He's lifting up his community by volunteering to read to kids at local elementary schools. It's all in an effort to be a positive influence on his neighbors. “One environment is not just yours. It's everyone's there. So, if everyone is doing better then the environment is better and so is the world,” he said. His drive to succeed, both on and off the field, comes from family. If it doesn't work out, he'll be ready. He has his priorities straight. His journey is just beginning. Congratulations Deon Hunt. You're this week's M&T Bank Student Athlete of the Week.